LAST MEETING: Calgary won, 13-8, at the Scotiabank Saddledome on Apr. 8, 2017. It’s a battle of two teams looking for redemption in the 2017-18 season. Calgary finished 2017 at the bottom of the West, while Buffalo held that position in the East. Both teams have added pieces to their rosters this year in hopes of returning to the playoffs. The Bandits missed the playoffs for just the fifth time in franchise history, after appearing in the NLL final the year prior. The Riggers missed out on the post-season for the first time in 15 years. With the first overall pick in the 2017 draft, Buffalo selected left-handed forward Josh Byrne from Hofstra University. So far in 2017, he’s registered 10 points (4g, 6a). Forwards Dhane Smith (4g, 14a), Callum Crawford (5g, 6a), Mitch Jones (7g, 6a), and Jordan Durston (2g, 6a) have formed an exceptional offence unit to begin the season. However, their back-end hasn’t been as successful. 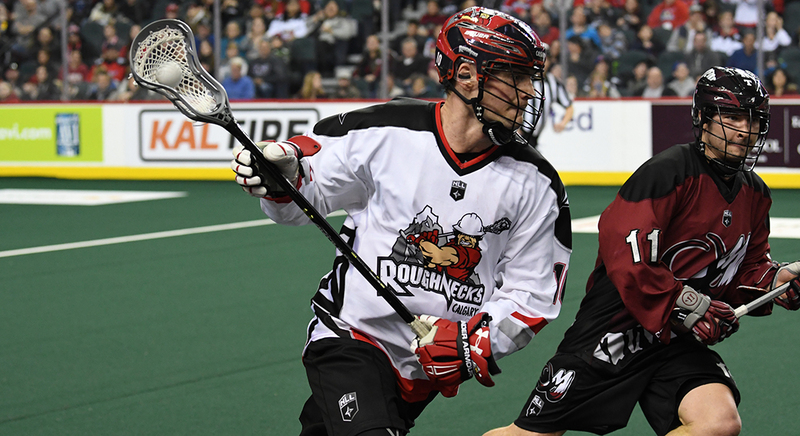 After holding the Toronto Rock to nine goals on opening night, the Bandits have given up 41 goals in their past two games, losing 21-9 to the Rochester Knighhawks and 20-13 to the Rock. Their trio of young goalies; Alex Buque, Davide DiRuscio, and Zach Higgins have all struggled so far this season, with Buque holding the lowest goals-against-average at 15.91. Given the Roughnecks struggles to score at times this season, facing off against a defence still searching for its identity could be just what the doctor ordered. In his second season with the Roughnecks, Loewen has found his scoring touch, leading the team with six markers through three games. The lefty has been playing great lacrosse to start the season and is able to make things happen with or without the ball in his stick. Against the Bandits last season, he netted a pair of goals and assists. Before moving to Buffalo in the off-season, the veteran forward was a pain in the side of the Roughnecks as a member of the Colorado Mammoth. Crawford scored seven goals and assisted on 13 more in just three games against Calgary. Now, operating a two-man game with elite goal-scorer Dhane Smith, the right side of the Bandits offence will attract a lot of attention from the Riggers defence. The Buffalo offence went through a large overhaul in the off-season, as they added lefties Jordan Durston and Byrne through trade and free agency, respectively. They also acquired star right-handed forward Callum Crawford from the Colorado Mammoth. Mix in Pat Saunders and former NLL MVP Dhane Smith and you have a very talented unit. The Roughnecks defence will be in tough to stop this group, but if they can limit their quality chances, they’ll give their team a chance to leave Buffalo with the win.